The Alberta Securities Commission (ASC) is the regulatory agency responsible for administering the province’s securities laws. It is entrusted with fostering a fair and efficient capital market in Alberta and with protecting investors. As a member of the Canadian Securities Administrators, the ASC works to improve, coordinate and harmonize the regulation of Canada’s capital markets. ASC deployed a three-part campaign to maximize the Fraud Prevention Month hook. 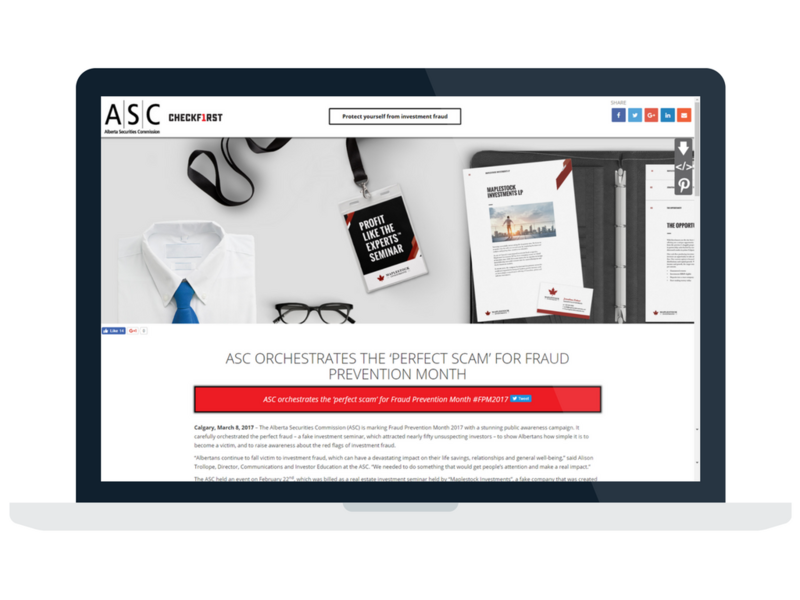 To give the campaign a longer lifespan, each part was designed to feed CheckFirst, the ASC’s consumer website, which provides information, quizzes, and case studies on recognizing and avoiding investment fraud. To create dramatic impact (and a share worthy educational moment) the ASC produced a fake real estate investment seminar modeled after those produced by actual fraudsters. “We consulted our enforcement team on every detail to truly replicate a real investment seminar put on by scam artists,” said Tuncay. An actor was hired to play a high-ranking financier at the non-existent firm, Maplestock Investments. The team created a fake online presence for Maplestock Investments that included a company website, Facebook page and even a LinkedIn profile for the actor. The seminar was marketed heavily on channels commonly used by scam artists such as Eventbrite, Facebook, Craigslist and Kijiji. The group also planted plenty of “red flags” within the campaign — opportunities for would-be investors to discover the truth. For example, neither the fake company or the financier were registered with the ASC, which is a requirement for selling investments in Alberta. Furthermore, the event ads included promises of “guaranteed returns.” No investment is a guaranteed money-maker. Halfway through the well-attended event, the audience learned that the entire seminar was a set up. Video footage was edited into a powerful educational video that shows the reveal and the shocked reactions. To promote the successful stunt to the public, the ASC’s PR agency, Edelman, recommended using Cision’s Content Centre, a custom webpage designed to host and promote multimedia content. Here, the team was able to consolidate and showcase all the campaign’s assets alongside a news release (also distributed on Cision’s national newswire powered by CNW) explaining how the event came together, why the ASC did it, and summarizing the red flags investors need to watch for when considering an investment opportunity. The Content Centre also contained a click-to-tweet option right at the top, allowing readers to share the story quickly and easily. The ASC was particularly satisfied with the reach and engagement with its Content Centre promotion. “We received multiple interview requests within the first day of the Content Centre site going live,” said Tuncay. The multimedia assets each saw hundreds of views and the ASC’s investor education website, CheckFirst.ca, received a spike in traffic. The Content Centre also generated multiple social shares on Facebook, Twitter and LinkedIn. 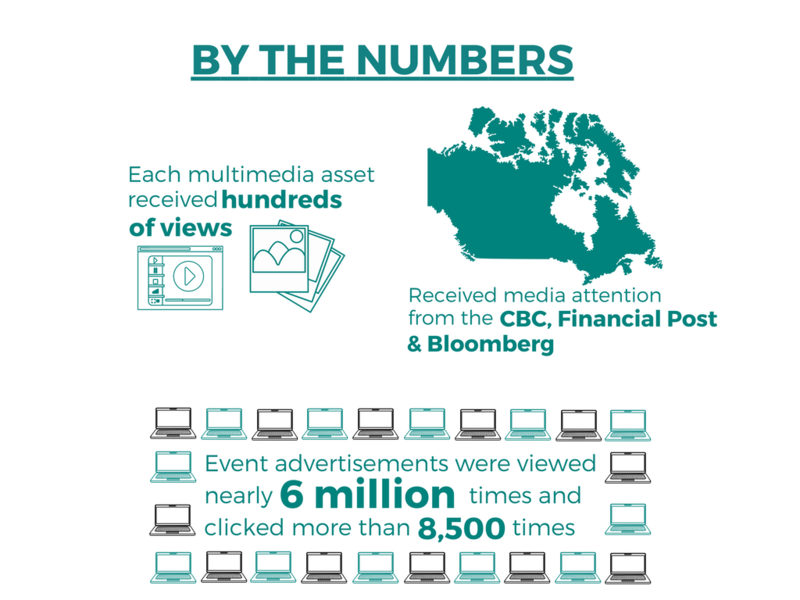 While most earned media coverage was local within Alberta, the ASC also received national and international coverage from several outlets including CBC, Financial Post and Bloomberg. “We aimed to grab the attention of Albertans, but were excited to see that our campaign was noticed by national and international media outlets,” said Tuncay. Using Cision’s Visibility Reports feature, the team could see that Content Centre traffic spread beyond national borders to several states within the U.S. When it came to the design and delivery of the Content Centre feature, the ASC’s experience was quick and efficient. “Our turnaround time was much faster than what was quoted,” said Tuncay. The Content Centre design replicated the CheckFirst website, ensuring consistent branding across all campaign assets.